William Foege, professor emeritus in the Rollins School of Public Health, was named a Presidential Medal of Freedom recipient. Photo by Emory Photo/Video. In a White House ceremony May 29, 2012, President Barack Obama honored 13 recipients of the Presidential Medal of Freedom Award, including William Foege. President Barack Obama this week named 13 recipients of the Presidential Medal of Freedom, among them, William Foege, professor emeritus in the Rollins School of Public Health. The Medal of Freedom is the Nation’s highest civilian honor, presented to individuals who have made especially meritorious contributions to the security or national interests of the United States, to world peace, or to cultural or other significant public or private endeavors. The awards will be presented at the White House in late spring. Obama said, "These extraordinary honorees come from different backgrounds and different walks of life, but each of them has made a lasting contribution to the life of our Nation. They’ve challenged us, they’ve inspired us, and they’ve made the world a better place. I look forward to recognizing them with this award." Foege is widely recognized as instrumental in the successful campaign to eradicate smallpox in the 1970s. After serving as a medical missionary in Nigeria, Foege became chief of CDC's Smallpox Eradication Program and was named CDC director in 1977. In 1984, Foege and several colleagues formed the Task Force for Child Survival (now the Task Force for Global Health), which promotes childhood immunizations and prevents polio, measles, river blindness, and other diseases. 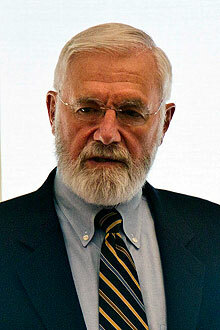 Foege served as executive director of the Carter Center from 1986 to 1992 and joined the Emory faculty as Presidential Distinguished Professor of International Health at RSPH in 1997. Two years later, he became senior medical adviser for the Bill & Melinda Gates Foundation. He retired from Emory and the Gates Foundation in 2001. He remains a champion of a wide array of issues, including child survival and development, injury prevention, and preventative medicine. Foege’s leadership has contributed significantly to increased awareness and action on global health issues, and his enthusiasm, energy and effectiveness in these endeavors have inspired a generation of leaders in public health. From 1997 to 2001, under President William J. Clinton, Albright served as the 64th United States Secretary of State, the first woman to hold that position. Doar was a legendary public servant and leader of federal efforts to protect and enforce civil rights during the 1960s. He served as Assistant Attorney General in charge of the Civil Rights Division of the Department of Justice. One of the most influential American musicians of the 20th century, Dylan’s work had considerable influence on the civil rights movement of the 1960s and has had significant impact on American culture over the past five decades. Glenn is a former United States Marine Corps pilot, astronaut, and United States Senator. In 1962, he was the third American in space and the first American to orbit the Earth. Hirabayashi openly defied the forced relocation and internment of Japanese Americans during World War II. Huerta is a civil rights, workers, and women’s advocate. With Cesar Chavez, she co-founded the National Farmworkers Association in 1962, which later became the United Farm Workers of America. Karski served as an officer in the Polish Underground during World War II and carried among the first eye-witness accounts of the Holocaust to the world. Born in 1860, Low founded the Girl Scouts in 1912. The organization strives to teach girls self-reliance and resourcefulness. One of our nation’s most celebrated novelists, Morrison is renowned for works such as Song of Solomon, Jazz, and Beloved, for which she won a Pulitzer Prize in 1988. An ardent advocate for Israel's security and for peace, Shimon Peres was elected the ninth President of Israel in 2007. Stevens served as an Associate Justice of the U.S. Supreme Court from 1975 to 2010, when he retired as the third longest-serving Justice in the Court’s history. In addition to an outstanding career as the all-time winningest leader among all NCAA basketball coaches, Summitt has taken the University of Tennessee to more Final Four appearances than any other coach and has the second best record of NCAA Championships in basketball.